Today, I planned to have the oil changed in my vehicle, then go to Nana’s/visit Mom. My plan was to go pick up a few items in the way of groceries when I finished visiting. Unfortunately, my truck broke down as I was en route. Jamie had to pick me up, and he had my Explorer towed to the shop (again). I was feeling quite pathetic. Tonight, I drove his car to our local convenience store. As I was standing in line, ready to pay for my “Dulce de Leche” bottled Frappuccino; I heard the bottle smash the floor! I didn’t even feel it slip from my grip. She then proceeded to clean up my mess, while refusing the help to clean that I offered. I tried to pick up the large glass pieces as she was making her way to the customer side of the counter, and she was being “such a Mom” telling me (worrisome and sweetly), “DON’T CUT YOURSELF! Let me get it!” I begrudgingly obeyed, and went to get another Frappuccino. Another girl was being so sweet…she instructed me to go to the empty register where she could ring me up. I offered (and expected) to pay for the drink I dropped, she would not allow that. She told me, “It happens to all of us, it’s okay.” 😕 I continued to offer to pay for the drink I had dropped, and she told me not to worry about it! This day has been a major FAIL! I awoke around 4:30 this morning, after a “disturbing” dream. I should have written about it when the “hallucination” was fresh in my memory. Instead, I opted for sleep–as detailed as the story progresses, I explain a bit more. In my dream, I can not vividly picture the details in my mind’s eye; I recall that I was frantically searching for my boy. The Princess was with me, after I asked her to “Please come here” for the second time; but, Mr. Whiskey was not able to be located. I was distraught! The Princess was by my side, giving me comfort as I was calling Whiskey. He NEVER showed, and I promptly awoke–frightened! I lay in bed, hoping to hear the jingle of their tags. When I did not hear them…I got out of bed, and swiftly walked to the kitchen, where they sleep at night in the puppy bed. Whiskey started walking to the door…I always take the baby’s outside to potty when I first see them each morning. I continued showing Coco love, by petting her head. She licked my face, as per her usual action. I scooped Coco up into my arms…and I walked to the door, where Whiskey was excitedly trying to tell me that he needed to go outside. I unlocked the door; Whiskey quickly went out of the puppy door that Jamie had installed when our deck was built. I walked out of the door, and put Coco on the deck. The two of them went to the “screen door” so they could be let out. They both “did the deed”, and happily ran back onto the deck. I decided to lay with them both in the puppy bed. I was relieved as I lay with Coco and Whiskey lay down in the crook of my side. When the sun started to rise, I got up, and they both were ready to go get in “The Mommy Bed” with their Daddy…and myself. It amazes me when I recall how I always said to “crazy dog people”…”It’s JUST a dog!” That will never be true when these babies are concerned! Coco positioned herself in my neck pillow…! "Writing is simply thinking through my fingers." I really need to stop holding my thoughts and feelings in. Writing frees (sic) me…so, why do I not utilize the opportunity to feel free!? And post photos of my babies! I just love the way Princess Coco is seated so "ladylike." And Mr. Whiskey is so handsome! I swear there are friendly, albeit mischievous, spirits who live in our home. Or maybe even visit from time to time. I have SEVERAL reasons to believe this and the following incident is yet another one. My “pre-engagement ring” is too large on my finger, despite having it re-sized. When my hands are cold (like now), the ring tends to turn all directions on my finger. This was beginning to annoy me, so I took it, and the other ring that I keep on my right hand (with a PURPLE stone) off. I carefully placed both rings on the Lazy Susan on top of our dining room table and continued to surf the web via my laptop as I sat at the table. I got up and walked into our living room a couple of times, to check on my 3 loves as they all lay on the (horrible, uncomfortable, UGLY) giant beanbag as they were watching college basketball. I decided that I should put my “pre-engagement” ring back on my finger. When I looked atop the Lazy Susan, the lovely ring was not there; only the one with the purple stone. I looked all around my seat on the floor, on the table, underneath things…and still did not see it. I walked into the living room a couple more times, investigating places I may have laid it. I scanned the kitchen thoroughly; as I had given up, and decided to wake James to alert him of what had happened (thinking he may be able to help me figure out what I could have done with the ring); I walked into the living room, and he was “resting his eyes,” so I decided to wait before telling him–I did not see the point in waking him because the ring could only be in the kitchen, and maybe even the living room. 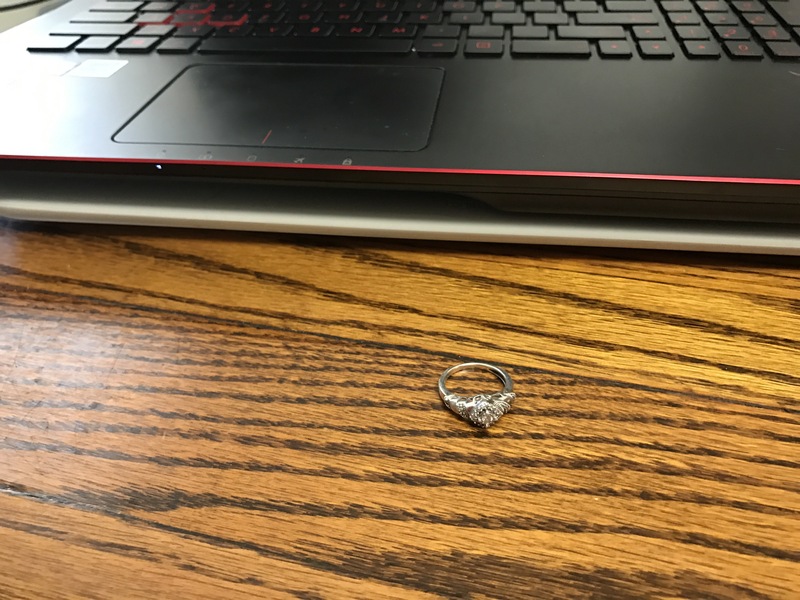 I walked back to my spot at the kitchen table, and still could not find my ring. I concluded that I should look again in a few minutes, because I tend to overlook things now when I put pressure on myself to find them. 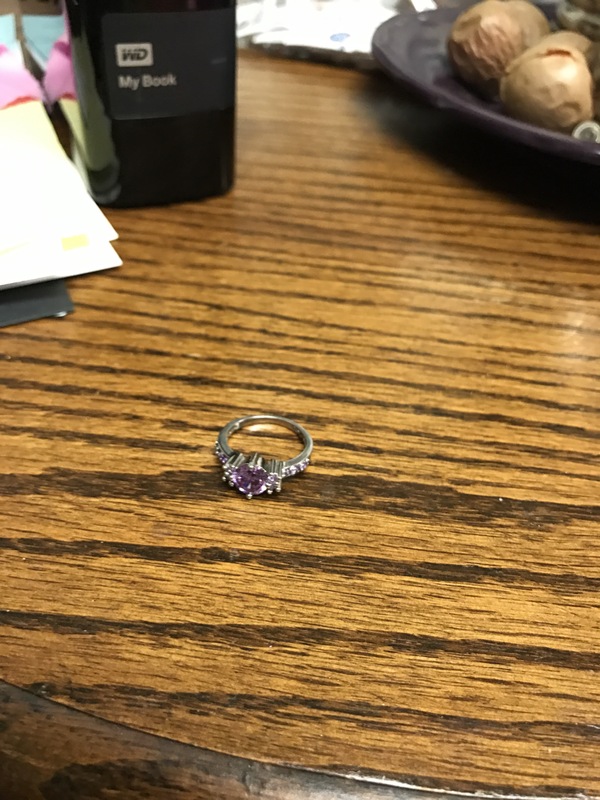 My purple stoned ring was still sitting atop the Lazy Susan, when I suddenly saw a diamond sparkling right in front of me! I am positive that I did not overlook the ring sitting directly in my field of vision, and within my reach. The friendly spirit played a joke on me. I believe this. I have had several encounters and witnesses to prove that my belief in a spirit visiting our home is valid.